Every day I check the letterbox with the kind of hopeless enthusiasm of a dog begging for a walk. On January 23 this year (I know this precisely, because our application number is DA17.423S.2006.23.1.8) I applied to the council for permission to build a toilet. 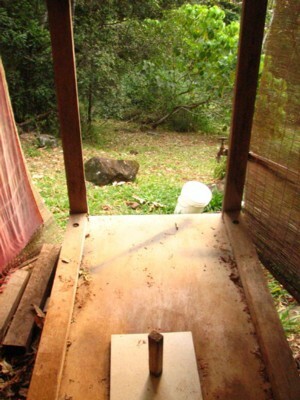 A simple, sophisticated Clivus Multrum composting toilet. In our climate of five storey hotel blocks and multinational chain store restaurants on every corner, you would think a toilet would not be a controversial request. It has now been seven months and still I don't have that elusive permission slip in my possession. I live in a toilet-free zone. When we first bought this house, I said to Lovergirl, in my prissy city voice, 'I am not moving in until we have a toilet'. It's a long story, but Gary the impassioned toilet man talked us out of installing a toilet at the time. He was underwhelmed at my plans to plonk a toilet in the corner of the bathroom (not an unusual place for a toilet, I would have thought). 'With this vista,' he enthused, 'You could really have a toilet. A toilet with a view. A toilet that is a retreat, a place of comfort and beauty. And there's nothing wrong with your current toilet.' So we put off the toilet and focussed on other much-needed house renovations (internal walls, and getting rid of termites), until we could afford to build this dream toilet of beauty. Three years we have been in this house and still no toilet, aesthetically pleasing or otherwise. Wait, I hear you saying, you must poo and wee somewhere. (You probably say poo and wee if you have children. Otherwise I imagine you say 'relieve yourself' or some such. Aren't we coy with bodily functions? Defaecate and urinate are probably off the list of polite ways to say it - a bit too close to the truth. Blokes say piss - why? Harsh, virulent yellow word. Women don't say piss. Piss does stink. Piss takes me to horrible graffitoed concrete tunnels at railway stations, soaked in the accumulated stench of years of teenage boys playing games of drunken oneupmanship). This is where we wee. Spacious, yes; beautiful, indeed. Somewhat lacking in privacy - when we have visitors we need to duck down the side of the house. (Strangely, visitors tend to hang on). But mostly we just wee here. When we have visitors for a few days we set up the commode with a big plastic bucket under it. Lovergirl hates it, & some hardy types prefer to stick with our bush arrangement.Older people and children definitely prefer having a familiar seating arrangement for elimination purposes. The simple trick is to cover your contribution with sawdust. A fair bit of sawdust - at least the same volume as what you have just produced. This is remarkable in its capacity to absorb smells. I empty the bucket every morning. Two people will half fill a bucket each day (in case you were wondering). I read a fabulous book called Humanure which completely changed my attitude to toilets. Basically, why do we flush our waste hundreds of kilometres away with thousands of litres of drinking water? If the government subsidised composting toilets -they cost about $5000 to install - we could re-use our greywater with much less kerfuffle, and have fabulous compost to boot. 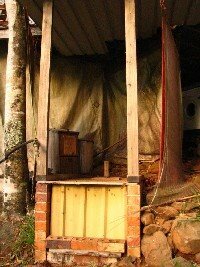 Why doesn't anyone talk about composting toilets in Australia? 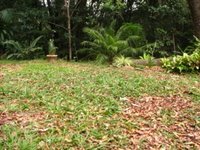 Imagine the whole of drought-stricken South East Queensland with composting toilets - how many litres would that save us a day? So I lied to you, dear reader. Of course we don't have NO toilet. We have this. This is where we poo. This is our homemade Indian-style composting toilet. Bill, the depressed alcoholic but very talented artist & owner-builder who built this house, and built it very well, stalled when he got to the toilet. He built this. Actually it's not too bad. The main problem is that because it has no walls, we can't use it when we have visitors. You can see we have put up some bamboo blinds for a modicum of discretion - even from one's lover one likes to keep some activities private. Again, a handful of sawdust after each visit and away you go. About every six months I open the front and shovel it into a bucket and carry it down to the compost pile at the bottom of the garden. After another six months or so, it is all broken down and gorgeous and I put it on the garden. One of the advantages of this arrangement is that I have become much less phobic about poo in my time here. I have done lots of reading about poo, in our culture and others. How Westerners treat poo, how other cultures regard poo, the history of poo...Our culture is very poo-phobic. Yes, it's smelly and unpleasant, but there's something drummed into us that makes us believe that poo is actually toxic waste. Disease-carrying. As the Humanure guy said - if no one in the house actually has typhoid, you aren't gonna suddenly catch it from the resultant poo. Although I won't go so far as to give up my Caroma loo at home, I didn't mind weeing and pooing outside as much as I thought I would - I preferred to go in the bush rahter than use the pit loo, despite its lovely view, and I just couldn't come at the commode, reminded me too much of a nursing home I think. You are absolutely right aoubt the issue we have with loos in this country. I've just read a fantastic and inspiring book called 'Living the Good Life' by Linda Cockburn, which looks at the many ways we can live more sustainably and reduce the size of our environmental footprint - waste disposal is a huge but largely ignored issue. Oh dear, there are so many things to feel anxious and guilty about, aren't there? I thought you coped exceptionally well - a regular swaggie. Did you watch 4 corners on greenhouse gases last night? I've ordered my free pack of energy-efficient light bulbs but with China expanding to the tune of the whole of australia's emissions every nine months, what's the point? Little Johnny came off looking like a twit though.